On this day, in 991, Byrhtnoth died at the Battle of Maldon. In his memory I give you a piece of writing. A version of it acted as a prologue to my book, but was discarded in the editing. It has come. The day I never thought to see. My friend is dead. We were of an age, but I thought I would be the first to go. Not him, so strong and vital. We talked briefly when he passed through Ely, a few brief days ago. We spoke of old times, a little about the battle to come, but nothing of the future. We both knew the truth; that he would die. It was his time. I followed behind the battle host. They moved fast, eager for the fight. I brought a slow cart, with which to carry his body home. Now it is finished. The sea wolves have gone, their boats sliding away, back to the sea. Triumphant but sorely depleted. They will not be back again this year. Perhaps next, but who will there be to send them home then, now he is dead? He did his duty, now I must do mine. The field is wide. The earth cut and bloodied from the fight. The smell of blood and death overwhelms me. There are others, searching for friends and relatives, hoping against hope that they will find a living body and not a corpse. Some perhaps look for plunder. They will look in vain; the victors will have taken everything of value. It is difficult to walk. I slip and fall to my knees. As I struggle to stand the body beside me moves. Is he alive still? No. Just the tug on his scattered guts that gave him the semblance of life and like a child’s toy he drops back to his everlasting sleep. I sketch a cross above his body and move on. The course wool of my cassock feels damp against my legs. At least the blood, and worse, will not show against the black Benedictine cloth. As I try to identify the lines of battle, the world turns red. The sky reflects the blood spilled on the ground below. The sun sinks towards the nearby town, set upon its hill. Flat land and water surrounds it. Ahead the island floats; separate, for now, from the land. That must be where the bridge joined it to this land, for there is the greatest spread of bodies. As I approach, I recognise some faces, or if they have no faces, the colour of some clothing or a pair of shoes. There is old Edward, my lord’s steward. What is he doing here? He should be at home, preparing for the harvest or sitting, watching his grandchildren play. Why did he come? To serve his lord, of course. It was his duty. But who is left to harvest the crops now? I move on, the bodies thick on the ground now, the wounds greater. He must be here, in the heart of the battle dead. Ah, there is Wulfmaer, cheeks rosy in the dying light, but beneath the lying glow, cold and bloodless. His eyes stare into mine, surprised in death. I close them and remember. He was son of my lord’s sister, brought up by him, who had no sons to call his own. So many men’s sons came to him, when he was great in fame, to be trained in weapons, to learn to become great men, but none as great as him. Close by is Aelfwine, another kinsman of my lord. I knew his father, his grandfather as well. His uncle was an Ealdorman of Mercia for many years. Young Aelfwine will never attain such high rank now. A flash of colour holds my eye. This was my lord’s banner, sewn by his wife. She will mourn his loss, perhaps. She has long wanted to embroider a cloth to celebrate his great deeds. A modest man, he always forbade it. Now she will have her way. Perhaps she will hang it in the Abbey, above his grave, for men to remember him, evermore. I smooth the cool silk. I need no reminder. He must be somewhere near. I search the gloom. The light is fading. There! A hand. I crawl closer. Yes, that is his. 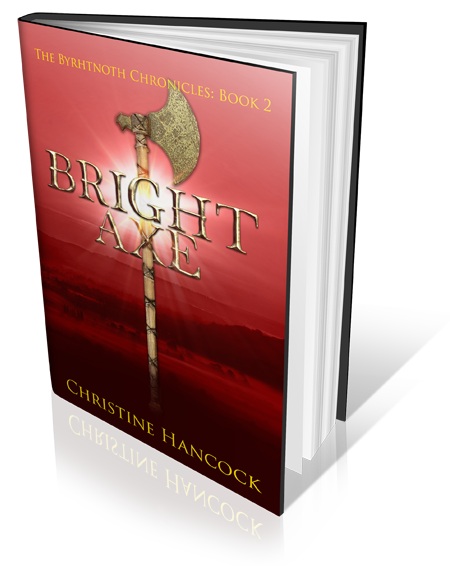 Long fingers relaxed that should be clasped around his sword’s hilt. I trace the scars that map the surface. Some old wounds, barely visible, others new, red raw, unhealed. It is hard to see now. Either the fall of night or tears dim my eyes, I know not which. I run my hand up the arm. It is starting to grow stiff. I must straighten it before the immobility of death falls upon his body. A wound near separates limb from body, nothing else could have caused him to drop his sword. This is what caused his death. Without his golden hilted sword he could not fight, and so he died. What other wounds will I find upon his body? I reach the shoulder, still broad and strongly muscled, even after all these years. He may have been a venerable adviser to the king, but he never let himself grow soft. I hesitate. Something is not right. I stretch my hand to touch his face and encounter… nothing. I hold my breath and feel the blood, still sticky, that covers the knob of bone that is all that remains. Was he dead when it happened, or did that noble blood spurt like a fountain to mark his murderers? Once he stood tall, towering above others. Now he is diminished, reduced to the stature of an ordinary man. The enemy knew his worth. They have taken the head of this famous warrior, to prove their own prowess in battle. Thieves steal honour that they cannot achieve themselves. I arrange the body. Straighten the long legs and place his arms at his side. I tumble other bodies away. I would know who they are, but I do not care, they are mere lumps of meat, I feel around the blood sodden ground for his sword. It is not there. Did one of his companions scoop it up to continue the fight, or was that taken as well by the invaders? It is quiet now. I hear the distant sound of celebration from the town. Why do they celebrate when my lord is dead? Because they are safe; safe to eat and drink, then go to their beds without fear. While he lies here, on the old ground, his duty done. They think the raiders have gone forever. They have not. They will be back, but who will defend this land then? The councillors who advise the king say that our land is rich. We can afford to pay them to go away. It will fail. They will always come back, greedy for our gold. Then when we have no more to give them, they will come and take our land as well, and make us slaves. A mournful note echoes across the field of dead. A pale shape floats on silent wings. Another soul ascending to heaven? Or just an owl hunting for a meal? Other animals will be searching for food. I must remain and defend his body until the day returns. It will not be hard; the nights are short this time of year. I will sit here beside him and pray for his soul. And remember. So much to remember. Days were warmer then and winters colder. The sun always shone. We would ride all day, racing on the hills or hunting in the forest. Our horses were strong and our dogs were swift. I remember hunting wolves in the north. He still possessed the skin of one. Whose body will it warm now? I remember fishing in the rivers, the fish were shinier and their flesh more tender than those I find on my plate nowadays. At night we would eat and drink. Many times the mead horn would circulate and we would drink deep of it. We would listen to the scop, telling tales of heroes long ago. Later we would boast of our own deeds; our battles always ended in victory. Then there were the women… but monks are not supposed to think of that. Life was so much simpler then. A man knew what he should do and did it. Not like now, when everything is politics and rich men strive for more riches, even the churchmen. Especially the churchmen. Have times changed or is it we who have grown old? They say the world will end soon; a thousand years after the birth of Our Saviour. I will see my friend again, if not before. I do not think I will long outlive him. But I have work to do. Does the sky brighten? Nearby, the dark treacherous river laps against a muddy shore. Is the bridge covered now, or open to the island? Yesterday it was important but now it no longer matters. A gentle breeze stirs the battle stink. Somewhere a bird begins to sing. Soon the cart will come. I stretch my legs, stiff from the night watch. I find the piece of silk and before it light enough to see the damage, I place it over the area of his missing head. Despite the desecration, I am glad I do not have to look into his dead eyes. That I could not have borne. I puzzle at the white feathers that move in the wind. No, not feathers; wisps of hair, white as swan’s down. Shorn from his beard when his head was roughly hacked off. I carefully collect them and save them between the pages of my prayer book. I will place them in the coffin, most of them. Perhaps one small tuft I will keep, for remembrance. People return, some with pallets or carts to carry away their friends. Others bring spades to bury the unknown dead. Soon the grass will grow again, thicker than before, fed by the blood spilt here. Eventually they will forget that anything important ever happened, in this field beside the cold dark Panta river. It must not be forgotten. That will be my final work. We will take his broken body to Ely. I will wash it in and anoint it with precious oils. I will wrap it with costly cloths and place it in the coffin. A ball of scented beeswax, studded with his hair, to replace his head. Then, when all is over. When I have spoken to those few men that survived or witnessed from afar. Then I will select the palest, smoothest parchment. I will grind the finest colours to make the ink. I will find the best of geese, select the straightest of their feathers and cut them to the perfect point. Then I will write. I will tell the story of this battle on the field near Maldon. I will tell of the words they spoke and the weapons they used. And I will tell of the death of the great Lord Byrhtnoth, son of Byrhthelm, Ealdorman of Essex, leader of the army of Aethelraed, King of England.